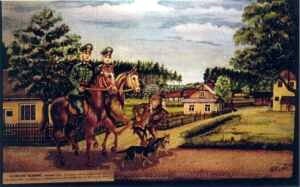 In the 1960s, Waclaw Kolodziejczyk, a former worker at the Belzec railway station, created 6 paintings showing Belzec during the German occupation. In the years 1939-1944 Kolodziejczyk supervised repairs to the rail tracks, and lived with his family in buildings close by Belzec station. Because he spoke and understood German well, the Germans used him as an interpreter for the purpose of contact with the Polish railway staff. According to some testimonies by local inhabitants from Belzec, he was even temporarily employed in the Commandant’s house as the person responsible for the SS store. There he had contact with the Jewish prisoners from the death camp who worked in the SS houses, and he probably learned some details about the camp from them. He never personally entered the death camp. “When I was a child, together with my parents I lived close to the railway and the territory of the camp. I remember transports arrived with Jews. Guarded by Ukrainians, other Jews were employed in the transport from the camp of the clothes of Jews who had been killed. The clothes were transported on small railway trolleys and the clothing was sorted. Then the clothes were loaded onto wagons and were sent by rail in the direction of Lublin. Waclaw Kolodziejczyk retained his memories of the camp until the 1960s. After he had retired, he decided to produce the paintings in order to present both his knowledge and his visualization of the camp. Because he had never been inside the camp, many details are the product of his imagination. In the first painting, where the arrival of a transport and the moment of unloading are visible, we can see a depiction of the speech given to the deportees by the “Jew Irrman”. This is the first incorrect piece of information. Jirrmann was an SS-man who usually gave a speech to the arriving deportees, but sometimes this speech was given by the functionary prisoner from the camp, Sylko Herz. 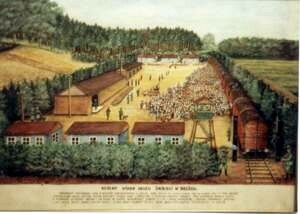 In the second painting, showing the moment of the burning of the deported Jews, there is no information about the gas chambers. It is probable that Waclaw Kolodziejczyk did not know about the gas chambers and since he had never seen them and did not know how they operated, he did not show them. 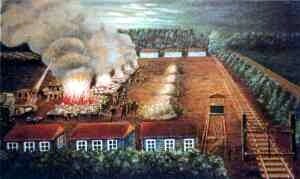 On the painting there is a depiction of the victims being burned alive. The next painting is about the punishment of Bartlomiej Panasowiec, an inhabitant of Belzec who was caught in the act of spying on the camp by the Germans. SS-men on horseback from the camp chased him, setting a dog on him and beating him. Panasowiec had to run through the whole village. This was intended to be an example to all the inhabitants of what people who wanted to know too much could expect. Bartlomiej Panasowiec was seriously wounded but survived. Because he was Ukrainian, he and some of his family were resettled to Ukraine after 1944. Even today Panasowiec’s story is very well known in Belzec. 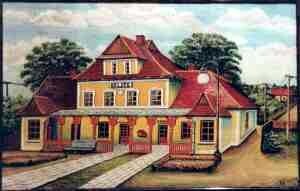 The fourth painting presents the old railway station in Belzec. All transports with Jews deported to the death camp arrived at this station. Documentation about the transports, notably the transfer telegrams, was also kept in this building,. In July 1944, two weeks before the Soviet army entered Belzec, the railway station was bombed by a single Soviet airplane. A German transport loaded with ammunition was standing in the station and was destroyed. Because of the exploding ammunition, all structures within a radius of about 250 m., including the building of railway station, were completely demolished. It was at this time that the original documentation about the transports was lost. Shortly before his death Waclaw Kolodziejczyk donated his paintings to the parish church in Belzec. These paintings remain in the old house of the priests until today. The Catholic priests in Belzec make no problems for visitors to Belzec who wish to see the paintings. Photographic reproductions of the paintings can be seen today at various exhibitions - for example in Berlin at the Wannsee Conference Villa and at the Memorial to the Victims of the Holocaust. But these exhibitions do not provide correct information about the author of the paintings and the paintings themselves are presented as a “good source” about the death camp. In fact the paintings by Waclaw Kolodziejczyk only represent the limited knowledge of the inhabitants of Belzec about the death camp. Collection of the testimonies gathered by Belzec Memorial Museum.